Last month SEGA kicked off its new SEGA AGES line with the return of two much loved Mega Drive classics. Sonic the Hedgehog needs no introduction, a game that by now everyone who has ever picked up a controller has probably experienced at some point in his or her life. Replaying this was a nostalgic albeit very familiar trip down memory lane and you can read all about my time with it in my review. Lightening Force: Quest for the Darkstar is the other game and one that is perhaps lesser known to the world, myself included. I’m always eager to go back and try older games from my childhood I may have missed but a shooter labelled by many as one of the best of its era only had me more excited. 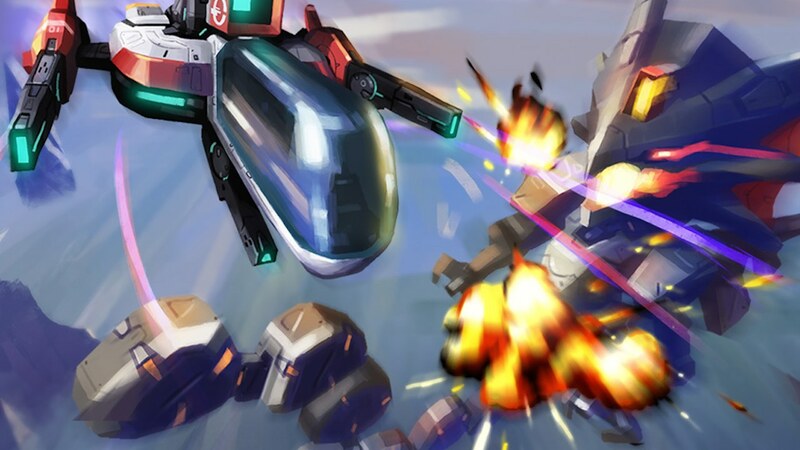 On the surface, Lightening Force: Quest for the Darkstar may look just like your typical arcade shooter experience and to a certain degree, you’re not wrong. You are manoeuvring your ship about the screen dodging an alarming number of bullets and projectiles as it constantly scrolls forwards. Your adventure will be split across several stages. You have a range of weapons and power-ups to help you and you’ll face off against huge bosses throughout your travels. As well trodden as this path may be though, Lightening Force: Quest for the Darkstar walks it with such style and confidence you can see why so many claim it as the best of its kind. Take for instance the graphics which sure by today’s standards might not exactly astound, still hold up surprisingly well not just from a design perspective but the sheer amount happening on screen at once. Can it be a little too much at times? I never found myself suffering, although the game can sometimes chug along when things get especially crowded even with the ‘reduce processing delay’ option switched on. It was annoying but never so much to interfere with the high octane action. Lightening Force: Quest for the Darkstar does a few interesting things that help give the game its own identity though. Despite the screen scrolling forwards you’re also able to shift it up and down as you move your ship toward the edge of the frame. It’s a cool effect visually but also helps elevate the sense of scale in battle. Perhaps the most unexpected – at least based on previous shooters I’ve played – is how the player is given the choice of what order they tackle the game’s opening four stages. It’s a refreshing change on the usual linear path you’re forced to take in other games of this genre. Weaponry is another area that Lightening Force: Quest for the Darkstar excels in, its arsenal a mishmash of satisfying projectiles that fire forward, backward, as spreads and more. Unlike other arcade shooters that simply replaces your current weapon with whatever you happen to pick up next, players can switch between multiple on the fly. This definitely proves invaluable as you attempt to deal with a barrage of enemies all coming at you from different angles. Much like M2’s other re-release Sonic the Hedgehog, Lightening Force: Quest for the Darkstar also includes a few neat extra features. Players are able to switch between the Japanese and international versions of the game, choose the screen size, apply filters and set the outside wallpaper. Better still are the inclusions of online leaderboards and even the ability to watch others’ replays – a handy way of learning how to improve your own runs. Perhaps the best feature of all though is the new ‘Kids Mode’, an addition that helps dilute the brutal difficulty somewhat by not stripping players of all their weapons when they die. By no means does this make the game a cakewalk, far from it. If anything it just offers you a small helpline in your mission of making it through to the end credits. You see, Lightening Force: Quest for the Darkstar is a very hard game, perhaps offputtingly so for some especially should you opt for the traditional mode where weapon retention is removed. It’s a game that relies just as much on your memory of attacks as it does your reflexes whether it’s dealing with waves of enemies or facing off against the game’s many intense bosses. It’s a fierce reminder of just how tough video games used to be and one that may split its audience.